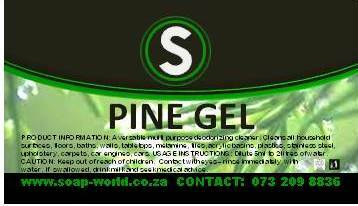 Soapworld Pine Gel is a versatile and economical multi purpose deodorizing cleaner. Pine Gel cleans all household surfaces, floors, baths, walls, tabletops, melamine, tiles, acrylic basins, plastics, stainless steel, upholstery, carpets, car engines, cars etc. USAGE INSTRUCTIONS: Dilute 5ml to 2 litres of water.